Harvest time in the Finger Lakes Wine Country is one of the most beautiful times of year. The smell of grapes in the air, the brilliance of leaf color during autumn, and perfectly blue October skies casting their reflections over lake waters are a sight to behold! Guests at the Starkey House enjoy a comfortable stay that is quiet and peaceful. They like the fact that the house is located very central to everything. It is right on Seneca Lake, just fifteen minutes to Keuka Lake and an easy ride to Watkins Glen, Hammondsport, or Penn Yan. 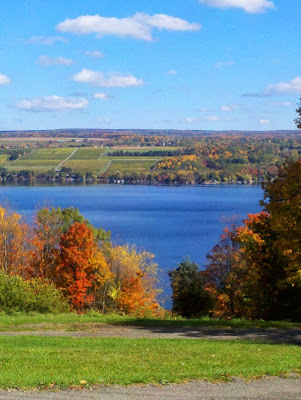 Also, the west side of Seneca and all of its terrific wineries and restaurants is only fifteen to twenty minutes away. Once they return home, they are happy to be away from the hustle and bustle of the villages and wineries, happy to kick back and enjoy a really good night's sleep. The rooms are spacious, clean, and comfortable. Some have private porch access with a lake view. I often find my guests out on the porches at night just taking in the stars that are so big you seem to be able to reach out and touch them. 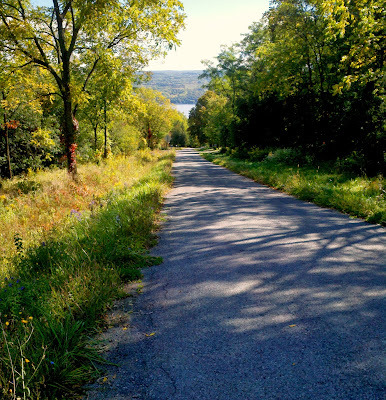 You can take an easy walk down to Seneca Lake from the house. Breakfast is prepared using the freshest ingredients sourced from local farms and produce markets. Specialty items such as honey, maple syrup, jams and jellies are always available. One of my favorite dishes to serve that guests love, is a cheddar omelet with bacon or sausage and toast. Here is a plate that has been served on the porch one sunny morning about a week ago. The lake is in plain view from here and the breezes are lovely! There is still lots of fair weather left to enjoy during the early weeks of November and December. Most wine trail activities continue through the holidays. If you haven't made your reservation yet just call Cathy at 607-243-7770 or E-mail cathy@1922starkeyhouse.com and mention that you saw this post. With a three- day booking in November you might get a $40.00 voucher towards a local fine restaurant to use during your stay! Rules: Cannot be combined with any other offer or coupon. Not to be used with Bed and Breakfast.com offers. Must mention this post in an E-mail or call to Cathy. Subject to room availability. Subject to normal booking and cancellation policy as written on www.1922starkeyhouse.com.